This post may not appeal to everyone on my blog but I would like to tell you guys about what 5 cards are the best a most important in my deck. 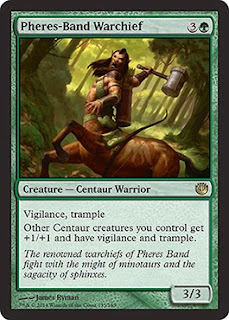 I play a Red/Green deck which primarily consists of Centaurs as its creatures. Hope you guys enjoy and let me know what your favourite cards are! I play most of my games at Sixth Form with my friends where we usually play alot of 4 player, all v all games which is why this card is in my deck. 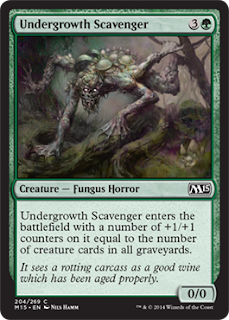 Undergrowth Scavenger is a 0/0 that enters the battlefield with a number of +1/+1 counters equal to the number of creatures in all graveyards. This card plays perfectly in a games with tons of blood shed and death but in a 1v1 can be completely useless or just weak. 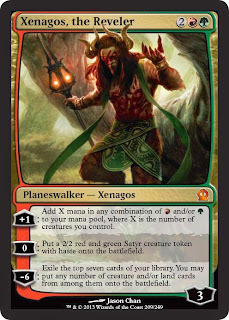 Xenagos is not very high up is my list due to its relatively weak abilities. 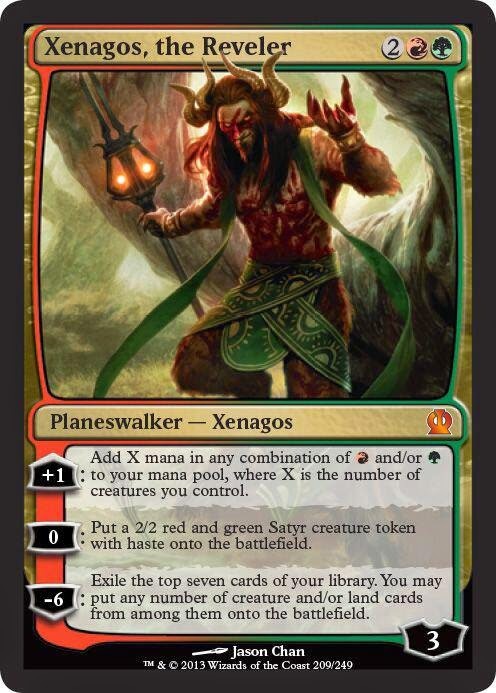 It's +1 gives you a combination of red/green mana equal to the number of creatures you control which isn't terribly useful to me as I has a few Market Festival cards in my deck which add 2 green mana to one of my lands. It's 0 gives a 2/2 Satyr Token which could be quite useful depending on when it is used and its ultimate (-6) allows you to draw seven cards from your library and places all creatures and lands straight onto the battle field. This is quite helpful for me as my deck contains some reasonably large creatures. The ultimate is quite costly though as Xenagos' starting devotion is only 3. If you ever play Magic against me then you will come to realise that I like to f*** s*** up. Even if I know I could end up worse of than before I will still play that card. Whims of the Fates is one of those cards. When played each player must separate all of their permanents into 3 piles (which can be empty) and roll a dice to randomly sacrifice that whole pile. This has the potential to give you a huge advantage if you can keep most of your cards and your opponents don't or it could mean game over for you bu losing all of your cards. I'm known for always putting my permanents into the same pile so I have a 67% chance of keeping all of my cards but a 33% chance of losing them all. Totally worth the risk. 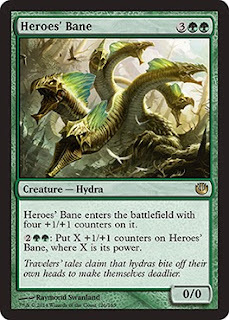 Heroes' Bane is a 0/0 Hydra that enter the battle field with 4 +1/+1 counters on it. You can pay 4 mana to pull a further amount of +1/+1 counters on it equal to that creature's power. This is essentially double the power and toughness of your creature every time you pay the 4 mana. The biggest I've managed to get Heroes' Bane in a game is into a 128/128. I also had this equipped with Fleetfeather Sandals which gives it flying so it became almost unstoppable and won me the game. This card wouldn't be considered 'amazing' in general but it is essential in my deck. The creatures in my deck are predominantly Centaurs so because Pheres-Band Warchief gives all other Centaurs +1/+1, vigilance and trample this makes my deck so much stronger. Especially when I have a few of this card out at any one time. 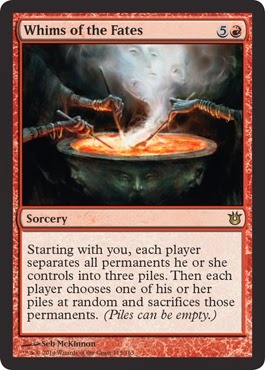 The only downside to this card is that it doesn't gives the other centaurs this +1/+1 in counters so when it dies the other centaurs don't keep their +1/+1. Without this card my deck would be considerably weaker. Thankyou for reading, let me know what you favourite MTG cards are!